The City of Winston-Salem is proposing $9 million in improvements and upgrades to Bowman Gray Stadium, the home of WSSU football. The project would be completed over three years. Bowman Gray Stadium would remain in city hands and receive $9 million in improvements and renovations to better accommodate Winston-Salem State University football and Bowman Gray racing under a proposal officials announced on Wednesday, Nov. 14. The comprehensive package of improvements would address the stadium’s aging infrastructure and make improvements to the field and the race track. The improvements plan also envisions adaptable signs and other features that would “brand” the stadium for Rams football in the fall and for Bowman Gray racing in the spring and summer. The field would be renamed “Rams Field at Bowman Gray.” The proposed improvements must be approved by the City Council. The proposed package of improvements includes new restrooms and concession stands; a new high-capacity Wi-Fi system to serve fans, journalists and event staff; and parking, seating, landscaping and irrigation improvements. Also, the football field would be regraded; the race track would be resurfaced; the field house, ticket booths and press boxes would be refurbished; and utilities upgrades would improve the water pressure in stadium facilities. To minimize disruptions of operations, work would be conducted in phases over three years, during the four months from December to March between football and racing seasons. As much as possible, existing facilities, such a concession stands and restrooms, would remain in place while the replacement facilities are under construction. The city agreed to sell Bowman Gray Stadium to WSSU in 2013, but that sale has been subject to a lengthy process of approval by the UNC System, the General Assembly and several other state agencies and was still pending. In recent discussions, university and city officials agreed to pursue a new approach whereby the university would remain a tenant, and the city would upgrade the stadium. Earlier this year, a university adopted a 20-year master plan that included a 6,000 seat on-campus football stadium. Robinson said WSSU has hundreds of millions in construction and improvement needs that would take priority over a football stadium and does not envision constructing a stadium before the conclusion of the lease agreement with the city, which runs through June 2037. Bowman Gray Stadium was built during the Great Depression under the Works Progress Administration. Nathalie L. Gray, the widow of R.J. Reynolds Tobacco President Bowman Gray Sr., donated the $30,000 of the required $100,000 local match to the federal grant to build the stadium. The stadium opened in 1938 and hosted high school and college football games, and other open-air events. NASCAR racing started at the stadium in 1949, and in 1956 it became the home field for Winston-Salem State. The stadium is one of the most unique in the country, and recently ranked as one of the 13 most scenic stadiums in NCAA Division II football. On Oct. 29, Bowman Gray racing and Winston-Salem received national exposure with the premiere of “Race Night at Bowman Gray,” a new show on the Discovery Channel. 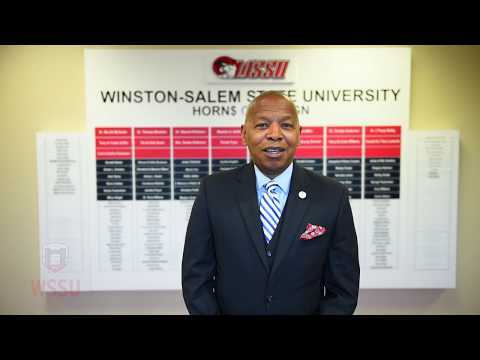 The new plan was announced at a news conference inside the field house at Bowman Gray Stadium attended by Robinson, Joines and officials from Winston-Salem Speedway Inc.
Video: Chancellor Robinson address WSSU alumni and fans.